Review by Prof. Tom Shippey of Jesse Byock, Viking Language - Old Norse, Published SMART. Old Norse has long had the potential to be extremely popular as a language-learning course, even under modern circumstances. Some twenty-five years ago, at Leeds University in England, it was so frequently selected as a subsidiary subject for students in the English Department – taking a subsidiary was then a first-year requirement – that although it was competing with everything from French to Sociology, numbers still had to be capped at double the capacity of the Language Laboratory, students being taught in two shifts. The appeal was partly having two dedicated specialists in the area – Andrew Wawn and Rory McTurk, both fluent speakers of the modern Icelandic form of the language as well as readers of the old form from the Viking Age – but also the fact that Old Norse / Icelandic comprises one of the world’s great literatures. In modern times such a course would readily qualify both as a language-learning and as a cultural-diversity requirement. The problem back then was, what text to use and how to teach the language…. Vikings are box-office, and many people want to know more about them, and about runes and myths and sagas. The problem has now been rendered redundant by Jesse Byock’s course Viking Language. This consists of two printed volumes, large format and large print. The first (Viking Language 1) is what once upon a time would have been called a “Primer,” to lead you into the language, while the second (Viking Language 2) is labelled as “The Old Norse Reader”, with longer and longer selections up to (as in Gordon) the entire short saga of “Hrafnkel Priest of Frey” – perhaps the most enigmatic and challenging of all the “sagas of Icelanders.” To go with them are two sets of audio recordings which one can download from i-Tunes. These accompany and take you through the readings of volume 1. To put it briefly, these are all anyone needs to gain a thorough reading knowledge of Old Norse. Additionally, there is the considerable bonus of acquiring a modern native-speaker pronunciation. Even the many academics who have done their best to learn Old Norse old-style, and then to teach it, will benefit from working through the course. As for students coming to the language without prior experience, they have it all: a very thorough grammar, but carefully spaced-out, explained without short cuts, and reinforced by exercises graded from absolute no-knowledge upward; well-selected and well-varied texts, with considerable use not only of the sagas but also of runestone-inscriptions, eddic poems and even notoriously difficult skaldic poems; and cultural background which takes in strange reports like that of the Arab traveller Ibn Fadlan (which gave rise to the movie The Thirteenth Warrior), maps, explanations and reconstructions. There is no-one better-qualified than Professor Byock to link up sagas with archaeology – it was he who famously suggested, in the pages of Scientific American, no less, that if one took the sagas seriously, then a case could be made for saying that Egil Skallagrimsson, most famous of Icelandic Vikings, owed his physical peculiarities not to being descended from trolls but to suffering from Paget’s disease. He characteristically followed up the idea by visiting Icelandic hospitals and discovering that the genetic peculiarity remained unusually common in the modern Icelandic population. His current excavations at Mosfell outside Reykjavik are again bearing witness to the accuracy of saga comments. His course will be a delight to use on every level, will surely far increase the number of students applying themselves to Old Norse, and satisfy a demand widely felt outside as well as inside tertiary education. It is the biggest reinforcement to philological studies, combining language and literature, since Tolkien. Both Tolkien and his friend Gordon would be delighted to see it, hear it and use it, and would agree for once that this is an entirely beneficent use of technology. Volume 1 works like this: After a brief but engaging “Introduction” to Old Norse language, literature and history (with maps), “Lesson 1” focuses on the “western road” to Iceland, Greenland and North America. There is a short (but not simplified or modified) passage from “The Saga of the Greenlanders.” This is a genealogy: “Herjolf was the son of Bard … the son of Herjolf … Ingolf gave land to Herjolf,” etc. This affords an opportunity to explain and illustrate nouns, pronouns and cases, rubbed in by a very easy exercise in which the student is invited to change a modern English sentence such as “Him went with his to he house,” into its correct form. For 99.999% of the English-speaking population, such an exercise reassuringly works, and is easy. Meanwhile, on one’s audio download, one hears Professor Byock’s Icelandic assistant Ása reading the passage: first all the way through, then broken into small units, with a pause in which a student is asked to repeat the phrase, then in larger units, with pauses again, and then all the way through once more. Unnecessary for a reading knowledge? Experience shows that saying the words is vital even for a reader who expects only to read silently. It fixes syntax in the mind, and vocabulary – for aural images are easier to remember than merely typographic ones. Each short text is steadily milked of its grammatical and lexicographical content, with cumulative effect. Meanwhile attention is held by explaining the cultural significance of passages – where sagas can be placed in the Icelandic and Greenlandic landscape, and what they say about even North American history – before switching the focus. Lessons three through five thus focus on inscriptions on runestone inscriptions, which are short, enigmatic, and suggestive texts. These texts are backed up by descriptions from the sagas of those memorialized, like King Gorm the Old, his wife Thyri “ornament of Denmark,” and his son Harald Bluetooth. In the same vein, Lesson 5 presents the carving of Sigurd Dragon-Slayer on the Ramsund runestone, which otherwise commemorates a local family who built a bridge as a work of piety. By the time one reaches Lesson 6 the reader can cope with human sacrifice and King Dómaldi from the ancient legend preserved in “The Ynglings’ Saga,” with further excitements of myth and feud, history and legend to follow. Another especially valuable feature is the use of word-frequency tables. “The total vocabulary of the sagas is surprisingly small,” Byock declares. Fewer than 250 words (out of a total vocabulary of some 12,400 in the “family sagas”) account for maybe three-quarters of their content. But which are the vital words? So often, on the old system, one spent half one’s time looking up in the “Glossary” at the back either words which would never recur, or more annoyingly, words which one should have memorized from the start. Byock drip-feeds the vital ones, so that by the end of Volume 1 the student should know them all, in all their grammatical forms. Viking Language 2: The Old Norse Reader expands that basic knowledge with more sagas, myths, runestones, and finally poetry, readers by now invited to work out and write in their own translations: even of enigmatic pieces like the Bällsta runestones, or the kenning-clotted skaldic poems (help still given with their dislocated syntax). A final tour de force comes from the Karlevi runestone, which has on it a skaldic poem in runes, written in ribbon-writing. Anyone who can disentangle, transliterate, and then translate that can feel a full sense of achievement. But that is the goal which anyone who works through the course will reach. If only such a work had existed fifty years ago, when this reviewer was struggling unsuccessfully. I was no further on than lesson 2, with the subjunctive form of the verb sjá, with no instruction at all, and no stimulation other than the lash of sarcasm! Modern students, and even superannuated ones, have every reason to be grateful to Ása and Professor Byock. Perfect guide to near perfect Old Norse! This book is a truly marvelous tool for learning Old Norse. The book series has it all: history lessons, maps, runic alphabet lessons and translations, the whole nine yards. I would caution those who are thinking of buying it to be aware of a couple of small things, however, before making their purchase. There is an MP3 audio set that does NOT come with this product. I will tell you that is almost essential, for those who have no access to native Icelandic speakers, to learn the pronunciations effectively. The lady who does the speaking, though, does so a mile-a-minute. It is still, I feel, almost a necessity if you're truly thinking of immersing yourself in the language. The appendix of this book, also, has some information that I feel would have been best introduced in the beginning of the book (e.g., vowel and consonant pronunciation guides, etc.) to better facilitate learning the language. The second installment of the series deals with direct translating and should be bought upon completion of this material. I hope this review was helpful! Grammars for dead languages often seem as fossilized as the languages themselves, stuck firmly in the 19th century. A quarter of a century ago I obtained E. V. Gordon's An Introduction to Old Norse which consists of reading passages and at the back of the book a "grammar" consisting of not much more than lists of noun paradigms and so on, and needing a degree in linguistics before you even know the terminology which is thrown in without explanation. Jesse Byock brings learning Old Norse into the 21st century. Reading passages are relatively short and progressively graded, and vocabulary building is chosen to give the reader the most common words to be found in the Old Norse sagas. Rather than masses of paradigm and conjugation tables hurled at the reader at the beginning, they are introduced in stages. Linguistic necessities are explained, so for example when older grammars may speak of "i-umlaut" without further description leading to a "WTF?" reaction from most people, Byock with great clarity takes the reader through the mechanics of front/back and close/open vowels and a full explanation of the cause of mutation. Linguistic pre-requisites are so minimal that he even explains fundamentals such as nouns, verbs, adjectives and so on. This does mean for someone like me that there is a fair amount of fluff to get through before "real" content, but on the other hand it means that Byock has written a book which makes learning Old Norse and gaining access to the sagas in the original a goal attainable by everyone. Exercises for the student are also pitched at a level which should give anyone confidence in being able to make progress. In addition to the language itself, there are sizeable sections in each chapter with historical and cultural background. As another reviewer noted, there are some layout oddities, but overall it's a difficult book to fault. 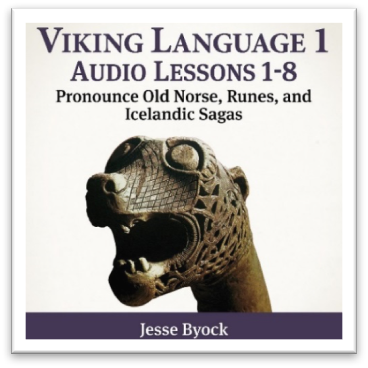 There are also two MP3s with readings - Viking Language 1: Audio Lessons 1-8 (Pronounce Old Norse, Runes and Icelandic Sagas) and Viking Language 1: Audio Lessons 9-15 (Pronounce Old Norse, Runes, And Icelandic Sagas). EDIT: Volume 2, which is apparently a reader rather than a grammar/exercise continuation, is now forthcoming: Viking Language 2: The Old Norse Reader. An excellent introduction to Old Norse! I bought this book only a couple of weeks ago and I am now well through lesson 4 (out of 15). The structure of the book makes it really easy to learn Old Norse. Relevant vocabulary and grammar are introduced with each lesson and learning is reinforced with exercises. Passages in English give details of the relevant historical background to each of the reading passages. Without indulging in levity, it is a refreshing change from the dry old books of grammar that preceded it. I can thoroughly recommend it! 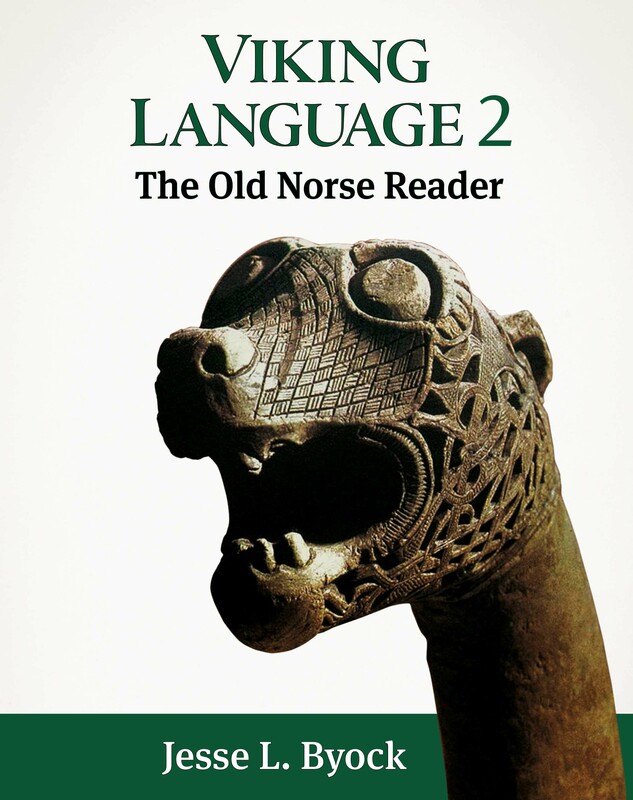 BUY THE NEW 'VIKING LANGUAGE 2 - THE OLD NORSE READER' TOO! 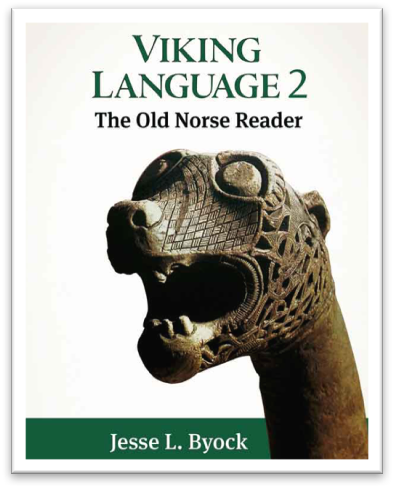 IMMERSE YOURSELF IN THE WORLD OF THE VIKINGS, BUT BUY THE NEW 'VIKING LANGUAGE 2 - THE OLD NORSE READER' AS WELL! IT'S CHOC FULL OF EXTRACTS FROM THE OLD NORSE SAGAS, EDDAS, SKALDIC POETRY AND RUNIC INSCRIPTIONS - READY FOR YOU TO READ AND TRANSLATE. - VIKING HEAVEN! 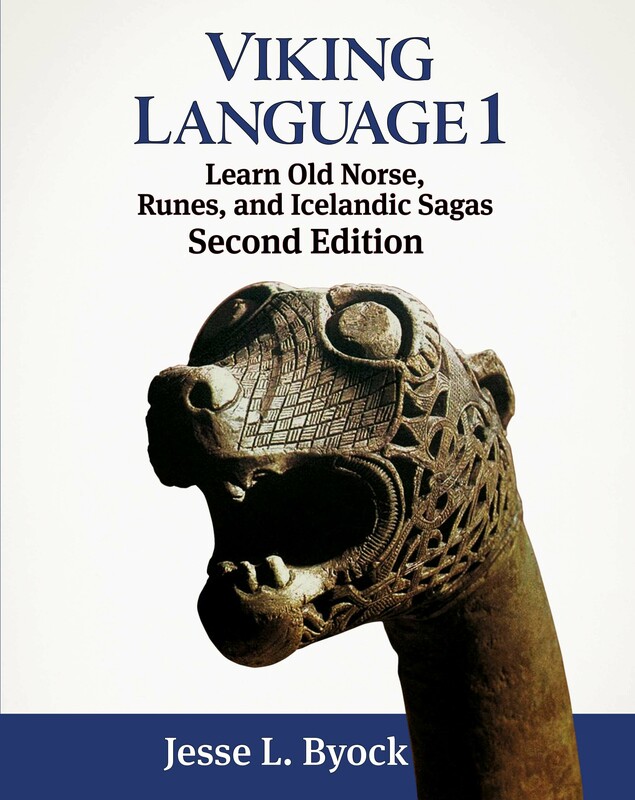 If you are fascinated by the Vikings and hanker after reading the sagas in the original Old Norse, but don't have any knowledge of Scandinavian languages, don't panic, because you have English as a starting point, and Professor Jesse L. Byock of the UCLA and the Mosfell Project, Iceland, who will teach you from scratch. I have a degree in Scandinavian languages, and was taught Old Icelandic, but because I didn't have Latin and German, which gives you quite a few clues, and a head start with the grammar, and also because I had to use rather dry text-books, I was never able to answer any grammar questions correctly in class. But nearly 30 years later, thanks to Professor Byock's stupendous 'Viking Language 1 - Learn Old Norse, Runes, And Icelandic Sagas,' the scales have literally fallen from my eyes! In his two fabulous books, Professor Byock really brings the Viking language and literature to life, and puts the Vikings into world context. In 'Viking Language 1,' as well as learning the grammar and vocabulary, you will learn runes, and be able to decipher runic inscriptions, be able to read and translate extracts from Old Norse sagas, and learn about Viking history, archaeology, mythology and culture, right across the Viking "empire". 'Viking Language 2 -The Old Norse Reader,' concentrates on Old Norse literary texts, and can be used alongside 'Viking Language 1,' or as a stand-alone - particularly useful if you already know Old Norse, but would like a flavour of sagas, runes, eddas and skaldic poetry, which will help you decide the direction of your future studies. I'm particularly thrilled to see that 'Njal's Saga' and 'The Tale of Audun from the West Fjords' ('Audun and the Bear') are included. There is a fantastic variety of texts to gorge on. This book has just come out, but I strongly suggest that you snap it up now, as it's bound to be a hit with students of Old Norse! Both books have useful quick grammar references, there are plenty of exercises/translation practice to increase your knowledge and many illustrations and maps. I'm excited to get the opportunity to learn about Professor Byock's excavations in Iceland. And how amazing and fascinating to be able to read 'Egil's Saga,' when Professor Byock and his team have been excavating the very homestead of the Mosfell chieftains! Don't hesitate! Amaze your friends! Amaze yourself! Go for it! And step back in time with 21st century scholarship and teaching..."Skål!" as they say in Sweden. Previous attempts to learn Old Norse ended in abject failure lost in impenetrable grammars with pages of exceptions to the rules - classic examples of not being able to see the wood for the trees. Even an attempt to get in via modern Icelandic failed. At long last though, thanks to this book, I am actually making progress. I am only just under half way through the first book but it is so encouraging to read sagas and already be able to pick out and translate (some) names as well as looking at runic inscriptions and being able to read and partially understand them - even if it is only the odd word here and there. A great book, well written and worth every penny if you are interested in the language and/or the history and would like to read the primary sources. Very much look forward to getting onto book two but there is no hurry because book one is a pleasure. Je reviens d'Islande et j'avais vu cet ouvrage en deux volumes en librairie à Reykjavik. J'ai eu 10 fois envie de l'acheter là-bas mais les valises ont un poids qui n'est pas illimité.... Donc, il était bien plus intéressant d'appeler Amazon au secours une fois rentrée. Cette langue est compliquée, imprononçable. Mais ces deux volumes sont progressifs et permettent également de situer un contexte historique, de s'informer sur les recherches archéologiques, l'origine des runes, de l'alphabet islandais ( certaines lettres n'existent plus qu'en islandais) et aussi de comparer les racines des mots, Et même si, pour parler, rien ne vaut une immersion , ces deux ouvrages se lisent très agréablement car ils combinent le contexte sociologique et historique avec une méthode linguistique précise, remplie de références grammaticales et d'exercices à faire. Excellent ouvrage, intelligemment construit qui permet de s'approprier rapidement un sujet qui peut pourtant sembler ardu. Trattare lp antico nordico come una lingua viva: obiettivo pienamente raggiunto dall' autore, che con fare didattico assolutamente moderno presenta allo scandinavista così come a chiunque sia interessato alla lingua delle saghe. La trattazione è assolutamente agevole; la materia è presentata in modo didatticamente fruibile a chi abbia deciso di studiarla. Il libro si apre con un' introduzione storico-linguistico-culturale dedicata all' Islanda dell' epoca e della lingua ivi parlata. Interessanti nonché utili le registrazioni in mp3 dei testi, scaricabili nel sito della casa editrice. In preparazione il secondo volume, costituito da un dizionario antixo nordico/inglese e inglese/antico nordico e da una bella e nutrita antologia di testi in lingua. Da avere. Dellos tesso autore consiglio "La stirpe di Odino" edito in Italia da Mondadori (Oscar). Jesse Byock knows what you're after. A lucid and informative textbook by an author who clearly understands why most people choose to learn Old Norse. If your final goal is to read the sagas and eddas, this book (paired with Viking Language 2) will get you there. If you came to Old Norse for the grammar....be honest, no you didn't. This is the audio portion for a wonderful new course in Old Norse/Old Icelandic by the same title: "Viking Language 1", which I am currently thoroughly enjoying. This audio set for the first half of the book may seem a little brief, and takes off at full speed, but the native Icelandic speaker has a pleasant voice and speaks very clearly. The readings are relevant, as they are taken from rune stones and sagas. The student is instructed to go back and listen to the same material repeatedly, which is necessary for grasping the pronunciation. It is highly recommended, as the pronunciation, spelling and grammar of Old Norse / Icelandic is significantly more difficult than modern Norwegian, Swedish or Danish. If the student takes the time to become familiar with the pronunciation from the audio readings early on, then it becomes much easier to read further Old Norse, Old Icelandic and Icelandic phonetically. This is an absolute must have for any serious student of Old Norse. I can't wait for the second part to be published. Good, clear pronunciation by a native Icelander, with plenty of readings. Just what I needed! I had very little idea how to pronounce any Icelandic before this. Now the Grœnlendinga Saga is a piece of cake. Hierzuvor hat es so was nie gegeben und es ist bis heute unvergleichbar. Das Buch beweist sich als eine ausgezeichnete vorstellung der Altislaendische Sprache, Kultur, und Geschichte. Als Sprachlehrer und wissenschaftler kann ich zweifellos dieses Material empfaehlen. Dieses Buch ist wirklich wunderbar. Es hat schon alles darin: Geschichte Lektionen, Karten, Runen Lektionen und Übersetzungen. Der Anhang dieses Buches enthält auch einige Informationen, die ich am besten in den Anfang des Buches eingeführt habe (z. B. Vokal- und Konsonantenausspracheführungen usw. ), um das Erlernen der Sprache besser zu erleichtern.